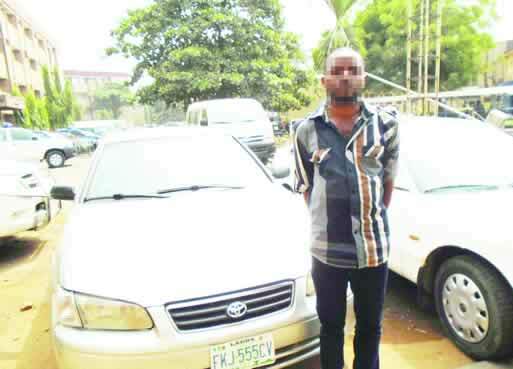 A suspected car thief, who posed with three others as traffic officials, has been arrested by the Lagos State Police Command. The suspect, John Godwin, was apprehended on Monday by operatives of the Rapid Response Squad while he and three others, still at large, towed a Toyota Camry in the Isheri-Oshun area of the state,Punch metro reports. It was gathered that the Camry, with number plate, FKJ 555 CV, had been stolen by the gang; and the car was being towed by a Toyota Corolla when the police stopped them around the Isheri-Oshun Roundabout on the LASU-Iba Road. When they were stopped, other members in the Corolla zoomed off. The rope used in pulling the stolen vehicle was torn, and Godwin was arrested. According to the police, the syndicate, which was led by one Ndubuisi, a spare parts seller, was taking the stolen vehicle to Mile 2, before it was intercepted. Speaking with PUNCH Metro, Godwin, who claimed to be a mechanic, said the gang leader, Ndubuisi, had invited him to assist him in moving the vehicle from the Isheri area. He said, “I met Ndubuisi in a hotel at about 10pm. He told me a vehicle broke down in the Isheri area, and he needed men to go with him to tow it to the Apapa area. I saw two men with him – Ade and Ebuka. We all entered a Toyota Corolla and headed for the Isheri-Oshun area. “When we got there, three of them came down from the car. Around 3.30am, they came back and told me that the vehicle would be towed. So, we started towing the Camry with the Corolla. “We tied a rope to the Camry, linked it to the Corolla, and we began to tow. We were on the LASU – Iyana-Iba Road when we saw some RRS policemen. The rope tied to the Camry broke, but to my surprise, both Ndubuisi and Ade, who were in the Toyota Corolla, didn’t wait. “Ebuka, who was with me in the Camry, on sighting the RRS operatives, also took to his heels. That was how I was arrested. The owner of the car, Joseph Inaboya, said the Camry was parked in front of his house, adding that he was not aware when the syndicate came to tow it away. On Tuesday, the police also arrested a suspected traffic robber, Bayo Folayemi, on the Oshodi-Apapa Expressway, while he and an accomplice allegedly stole a motorist’s wallet containing N4,500. Our correspondent learnt that the victim had raised the alarm during which policemen nabbed Folayemi while the other suspect fled. The Lagos State Police Public Relations Officer, SP Dolapo Badmos, confirmed the arrests, adding that the command would not tolerate crime in the state.